Although no single methodology detects malignancy in all cases, several molecular methods can be applied with high sensitivity and specificity. Southern blot analysis (SBA) requires fairly large amounts of fresh tissue and is both labor-intensive and time-consuming. Radioactive probes often are used, but fluorescent probes for SBA also are widely available. Furthermore, detection of a clonal rearrangement by SBA requires that at least 1% to 5% of the cells in the sample have the suspected abnormality. SBA remains a useful method for some testing, however, especially as an independent diagnostic method when clinical suspicion is high, and during optimization of TCR PCR tests.910 SBA of the TCRB gene is most commonly applied, and although it will detect more than 90% of T-cell malignancies, it is generally unable to identify gene rearrangements in clonal y§ T cells or NK cells. SBA requires DNA digestion by restriction enzymes, followed by electrophoresis and transfer of the DNA to a membrane. The DNA on the blot is then hybridized with probes directed against the TCRB constant region (CP) or probes directed against one or both of the TCRB joining regions (jpi and 2).11 An example of a TCRB Southern blot is shown in Figure 33-3. Even though a large number of rearrangements are present in a lane, only the clonal rearrangement reaches the detection level. As recommended in the recent Clinical and Laboratory Standards Institute (CLSI) guidelines,12 SBA is performed using three restriction enzyme digests of genomic DNA. The presence of up to two nongermline rearrangement bands in at least two of the three digests is interpreted as a positive result. A nongermline band or bands in only one of the three digests may represent an individual polymorphism or a true rearrangement. 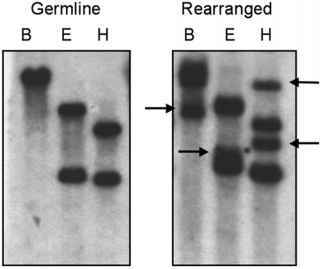 Only two of the three digests are required to show rearrangement bands, since one of the digests may have a rearrangement that is the same size as the germline band. The allowance for up to two rearrangement bands per digest accounts for rearrangement of both TCR alleles, or the creation of a new restriction site within the probe region, by the rearrangement. The presence of more than two nongermline rearrangement bands is interpreted as an oligoclonal pattern. Figure 33-3. Example of a TCRB Southern blot. Three restriction enzymes (B, BamH I; E, EcoR II; H, Hind III) were used on genomic DNA from germline (left) and T-cell lymphoma (right) samples. The lymphoma sample demonstrates one to two rearrangements (arrows) with all three restriction enzymes. TCRG variable and joining regions. The primers for regions Vy1-8, Vy9, Vy10, and Vy11, coupled with a group of J-region primers, are most widely used.16 After PCR amplification, the products can be visualized by methods including heteroduplex analysis, denaturing gradient gel electrophoresis, or capillary electrophoresis.17,18 Figure 334 demonstrates examples of TCRG PCR test results with clonality assessment by heteroduplex analysis and by capillary electrophoresis. Fluorescence in situ hybridization (FISH) on fresh and even paraffin-embedded tissues also are used to detect the t(2;5). 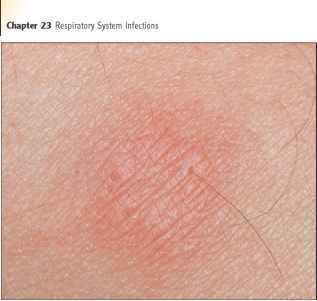 This method offers an improved rate of detection in paraffin-embedded tissues when compared to RT-PCR for NPM/ALK, but t(2;5) FISH is not offered as a diagnostic tests in most laboratories. Real-time quantitative PCR (RQ-PCR) is used to monitor patients for MRD after therapy, or for disease recurrence. The NPM/ALK product can be monitored with extremely high sensitivity (as low as 0.001% tumor burden), but RQ-PCR assays for this fusion transcript are generally not offered diagnostically. Quantitative TCRG detection of MRD has been studied in childhood acute lymphoblastic leukemia (T-cell ALL),20 which may be used clinically upon future optimization. In situ hybridization (ISH), other than FISH analysis, is commonly used for the detection and localization of EBV in tumor cells, particularly nasal-type NK/T-cell lymphomas. ISH can be performed on formalin-fixed, paraffin-embedded tissue sections and identifies evidence of EBV RNA within the nuclei of virtually all tumor cells. EBER-1 RNAs are most commonly targeted due to the very high copy number in EBV-infected tumor cells. Figure 33-4. (a) Example of PCR-based analysis of the TCRylocus with consensus primers for the joining (J1/2) region and for first family of the variable regions (V1), and visualization by heteroduplex analysis on a mutation detection enhancement (MDE) gel. After PCR amplification, the products are denatured and slowly allowed to reanneal (heteroduplex annealing), followed by electrophoresis. A clonal rearrangement will form a homoduplex band,which migrates faster than the heterogeneous polyclonal rearrangements. (b) Capillary elec-trophoresis of a clonal T-cell neoplasm and a reactive control.The arrows indicate clonal rearrangements detected with primers directed against Vyl-8/J and Vy10/J. Molecular weight standard peaks are present in the center of the left panels, and to the right of the right panels. Figure 33-5. The NPM/ALK fusion of the t(2;5) is the most common ALK translocation in anaplastic large cell lymphoma. The NPM gene has an oligodimerization (OD) domain, a metal binding (MB) domain, 2 acidic amino acid clusters (AC) and 2 nuclear localization signals (N).The ALK gene has a putative ligand-binding site for pleiotrophin (LBS), a Meprin/A5/protein tyrosine phosphatase Mu (MAM) domain, and a transmembrane (TM) domain in addition to the tyrosine kinase domain. Horizontal arrows indicate the approximate location of primers used for the RT-PCR amplification of this fusion.